Despite the dramatic turnaround, coach Bill O’Brien and the Texans (6-3) know that they haven’t accomplished anything yet. 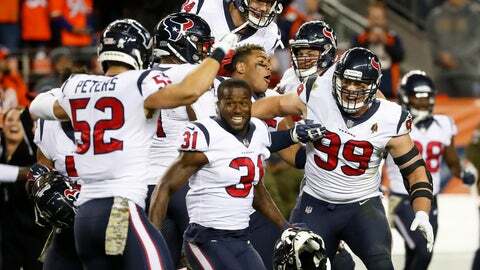 Houston’s latest win came in dramatic fashion on Sunday in Denver when the Broncos missed a field goal as time expired to allow the Texans to hold on for the 19-17 victory to keep their winning streak intact. Now they have two weeks to prepare before a trip to visit the Redskins on Nov. 18. Four of the team’s wins during this streak have come by a touchdown or less, giving the Texans confidence in their ability to win close games. O’Brien said his struggles were understandable considering he only had three days of practice to try and learn what he needed to know before Sunday’s game. While Thomas gets acclimated in Houston, the Texans have been impressed with the development of big rookie tight end Jordan Thomas. The 6-foot-5, 280-pound Thomas, who was a sixth-round pick in this year’s draft, has recently emerged as a great goal-line target. He’s grabbed three short touchdowns in the past two games, adding another dimension to Houston’s red zone offense, which struggled earlier this season. The Texans’ big winning streak has coincided with long skids by both the Titans and Jaguars, who both have just three wins. The Jaguars have dropped four straight and the Titans have lost three in a row entering Monday’s game against Dallas. “A team with grit, fight, one that can really overcome adversity, play good football in tough situations, take care of the football in critical situations, I think that’s the kind of formula that you want to have going down the stretch, hopefully, playing in the playoffs,” safety Tyrann Mathieu said.